The Urban analysis of people at risk of poverty shows similar patterns to the one for the regional analysis. Since values are related to national averages, it is difficult to compare countries. Some interesting cross-country observations can however be made. 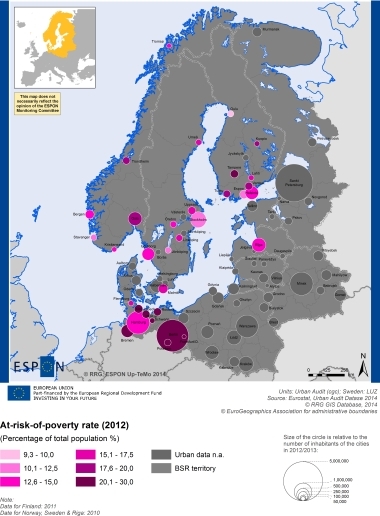 In Sweden for instance the share of population at risk of poverty is lower in the capital city than in other cities. The opposite pattern is observed in many other countries such as Germany and Norway, where the cities of Berlin and Oslo show higher poverty rate then e.g. Hamburg, Bergen or Trondheim. The indicator is interesting since it might unfold a reality which is not too well known; in many cities of the BSR the at-risk-of-poverty rate is actually as high as 15-30%. And in countries like Norway, Finland and Germany the distribution inequalities between and within cities seem to be rather large. Air pollution by small particles is related to urbanization and industrialization. 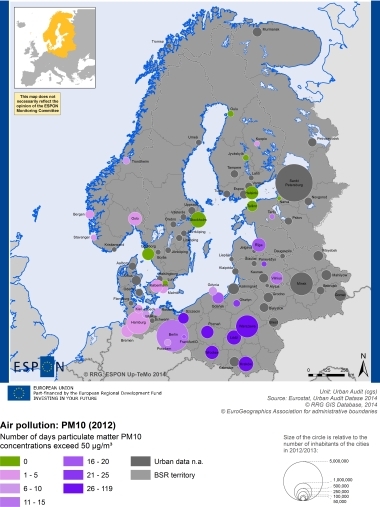 Areas where the PM10 concentration exceeds norm values most frequently in the BSR can be found in Germany, Poland, and the three Baltic states. Notably some large cities display zero days exceeding the norm, e.g. Tallinn, Stockholm, Gothenburg and Helsinki. A positive trend (in fewer days exceeding the norm value) can be observed mainly in Germany and in cities in southern and northern Poland. However, in central and eastern Poland the situation has deteriorated re has worsened with 11-40 more days each year above the threshold at 50 µg/m3.